HomeAfricaOpinion: Death Comes Calling When We Least Suspect – By Kwame Okoampa-Ahoofe, Jr., Ph.D.
Opinion: Death Comes Calling When We Least Suspect – By Kwame Okoampa-Ahoofe, Jr., Ph.D. It is a wicked irony of fate that just about the very period that Mr. Kofi Atta Annan, the former Secretary-General of the United Nations Organization, UN for short, thought that he was still endowed with a lot of time to spend a bit of commiserating with the family of Mr. Joseph Henry Mensah, the legendary Ghanaian economist and pioneering diplomat, precious life was rudely and abruptly snuffed out of him. This can be clearly gleaned from the very short note of condolence which the globetrotting and jet-setting former Chancellor of Ghana’s flagship academy, the University of Ghana, wrote to Mr. P. K. Mensah, the son of the recently deceased Finance Minister of the Kofi Abrefa Busia-led Progress Party (PP), in mid-July of this year. Interestingly, since he passed on just this past Saturday, almost none of the floods of tributes published about his life has mentioned the fact that until just August 1 of this year, the first Black-African UN Secretary-General was also the Chancellor of the University of Ghana, the oldest tertiary institution of its kind in the former British-ruled Gold Coast. 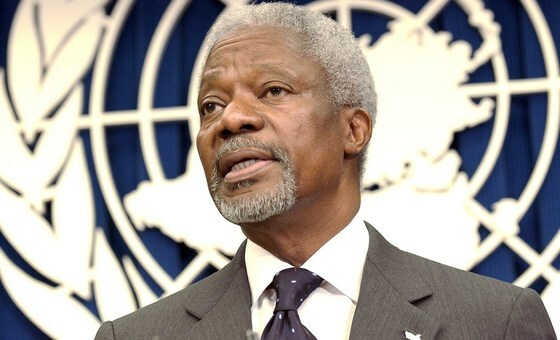 Anyway, in the letter written by Mr. Annan whose death was globally and seismically reported from his hospital bed in Bern, capital of Switzerland, on Saturday, August 18, 2018, the indefatigable globe-traipsing Ghanaian-born diplomat writes: “I will be in Accra over the coming months and hope to have the chance to personally express my sympathies” to the [entire] Mensah family. When I read the quoted line above, which also appears at the very end of his rather terse missive, I couldn’t help but recall the perennially celebrated poem by the immortalized 17th century British Metaphysical Poet, John Donne, which is titled “For Whom The Bell Tolls,” which Ernest Hemingway, the equally celebrated 20th century American novelist and journalist, borrowed as the title of one of his numerous novels. Somehow in Mr. Donne’s poem appear these very prophetic words: “Do not ask for whom the bell tolls/ It tolls for thee.” I could have readily Googled the poem to capture its essence more accurately and poignantly, but I have decided to let these memorable lines flow more naturally and fluidly. It well appears that Mr. Annan was announcing his own death, or physical demise, that is, when he penned and posted the preceding note, in which he rather cavalierly presumed to be both mourning the passing of Mr. Mensah, as well as celebrating the latter’s quite illustrious life at the same time. What Mr. Annan’s commiserative note tells us, who seem to take our lives and existence totally for granted, is that we are never really in charge or control of our won lives; and that, at best, our decisions, agendas and/or promises are mere speculative utterances. Which is also why the critical thinker begins to wonder when in the first nine words of the last paragraph of his commiserative note, Mr. Annan writes as follows: “I will be in Accra over the coming months….” The 80-year-old writer would shortly be taken ill and rudely and suddenly snatched from us; it clearly appears that Mr. Annan, whom, we are told, had been resident in Bern, Switzerland, for most of the past decade, was cocksure of the fact of his existence and good health in the coming months and even years, although he is also quite savvy or worldly wise enough to realize within the same breath, in classic Shakespearean parlance, that he is decidedly living on borrowed time. Which is why he also quickly adds, within the same sentence, that: “[I] hope to have the chance to personally express my sympathies.” And, of course, Mr. Annan is perfectly apt and smack within the established norms of protocol to sign off his sympathy note as follows: “Sincerely – with warmest personal regards.” But the stark fact of existential reality is that “sincerity” or “candidness” does not in any way guarantee the practical actuality or realization of our “hopes” and “aspirations.” At best, we are well-meaning dreamers in search of the fulfillment of our dreams. Which are also why beggars are never seen riding horses, because even our best wishes and/or intentions are veritable illusions. May Divine Providence grant our great departed one(s) eternal bliss.